Messier doesn’t sew : he resuscitates old singers put asleep years ago in order to release, in some magical ways, the luminous and sonorous presence of the past. he carries his public in a dreamlike universe where each machine, as singular subject, is magnified. after years of silence, sewing machine orchestra is giving speech to these surviving objects of the industrial era. His latest work – SEWING MACHINE ORCHESTRA – entirely orchestrated with the acoustic noises produced by 1940’s sewing machines amplified by means of microcontacts and process by computer, tackles the listener imagination primarily through the evocative power of those old industrial marvels. Whether they remind of specific incidents or recall the relationship to such objects, few people remain indifferent when they see them. This presentation is made possible with the help of Le Conseil des arts et des lettres du Québec. 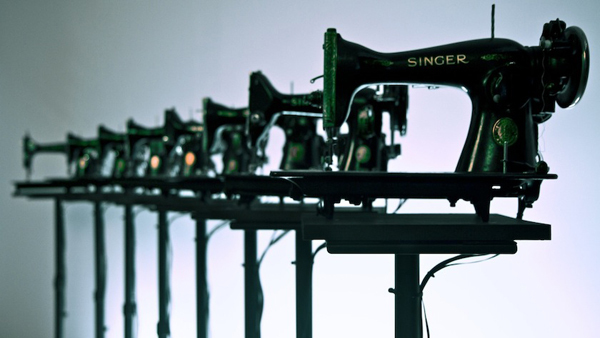 Sewing Machine Orchestra from Martin Messier on Vimeo. Martin Messier is a composer, performer and videomaker. If sound stands as the driving force of his work, Messier also quickly took an interest in the clash between electroacoustic music and other art forms as well as in artistic collaboration. That way, it is through the relationship between sound and material (objects or bodies) that messier’s work take shape. Messier constantly redefine the frontiers of concrete music by creating sounds with everyday life objects, such as alarm clocks, pens, self-conceived machines and sewing machines. At the very centre of this dialogue between sounds and objects is the desire to push the everyday imaginary a little further, to magnify these entities by giving them a voice and by reinventing their function. Messier also produces collaborative work mixing dance and music, trying to give life to sound through objects as well as bodies in movement. Here, through an inversed hierarchical relationship, music becomes the choreography’s driving force instead of being its mere accompanist. Martin Messier has presented his work in various national festivals and events (mutek, fta and mois multi) as well as in international ones (Berlin’s Transmediale, Sonar in Barcelona, Nemo in Paris, Scopitone in Nantes and Today’s art in The Hague). La chambre des machines also received a distinction at the prestigious Ars Electronica (Austria). In 2010, Messier founded 14 lieux, a sound production company for performing arts. This collaboration was created in order to provide a platform for such kind of sound work in the art scene.